The apartment has a private entrance. You enjoy one dedicated off-street parking space for the duration of your stay. This is a big deal considering our location :) There are no stairs to navigate, just two steps total. One step to enter the apartment and one to enter the bathroom. We have a gas wall furnace to keep things warm and cozy. The washer and dryer is behind a door in the kitchen, it couldn't be more convenient. All the lights including the bath are on dimmers, so you can create just the mood that you want. I was born and raised in Mill Valley, so please check-in with me if I can offer recommendations for restaurants, events and the works. I personally enjoy my autonomy while I'm traveling and will approach your stay similarly, that is to say, I respect your privacy. Just know that I'm more than willing and able to be of assistance to you prior and during your stay. Guests love our location and the the fine interior appointments. Just 15 minutes to San Francisco and 50 to the Napa Valley Wine Country! 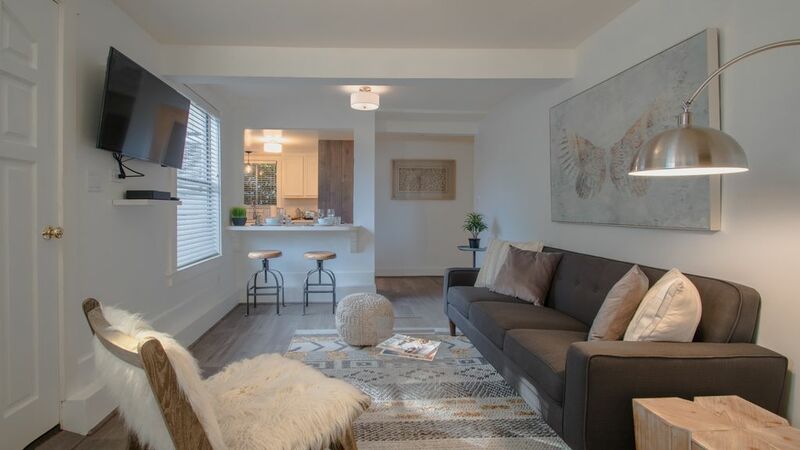 Arguably the best rental to use as a "home-base" and conveniently participate in all of the best that the city of Mill Valley, the Bay Area and environs has to offer. Our rental is especially rare since it's IN THE DOWNTOWN! Our guests say that it's everyone's favorite place to meet when friends and family are either visiting or staying in the area. Convenient, comfortable and fun are our hallmarks! toilet, shower, Modern and super clean. We enjoy the city's best weather and proximity to all the best our 'village' has to offer. Live theater, clubs, movie theater, shopping, restaurants, grocery & hiking/biking trails are all steps away! Tennessee Valley, Stinson and Muir Beaches are just 5-12 miles from our door. The Bay is 1.2 miles and the Golden Gate Bridge standing magnificently over the Pacific Ocean is just 6 mile away! You enjoy one (1) dedicated, free, off-street parking spot for the duration of your stay. Simply park at the end of the driveway on the RIGHT-HAND side. Located across the street at our Community Center. Fee applies. Condiments, coffee, spices, teas, etc. Flat screen that can be watched from the kitchen and living room. Smart TV. Patio with party lights -communal. We have an additional tenant that may take advantage of the outdoors as well. Ideal apartment for a couple in central Mill Valley. Fully equipped, was a useful base for visiting family in the area. Very cute and well equipped apartment in downtown Mill Valley. Close to the town square and many (great) restaurants that are within easy walking distance. Perfect for a couple visiting on an extended stay. The owner is easy to deal with and quite helpful as well. Terrific location, small but comfortable apartment, and great host in Gary. Very sweet and superiorly located apartment. Owner is very organized and communicates well. Bathroom may be an issue if you are very tall. Would do it again certainly! My wife and I stayed here for 10 days. It's cute and surprisingly spacious for two adults. And, you don't need to rent a car since it's in "downtown" where everything you need like the terrific Mill Valley Market and restaurants like nearby Prabh Indian Kitchen are literally a few steps away. If you want to go to the now auto-restricted Muir Woods (highly recommended) call Raj at A1 taxi or you can take the bus a half block away into San Francisco. Mill Valley is a picturesque California town of 14,000 residents and creative hideaway situated on the eastern slope of Mount Tamalpais. Nestled among redwoods, hills and canyons, Mill Valley is only ten minutes north of the Golden Gate Bridge and City of San Francisco, yet less than one hour from the Sonoma and Napa Valley Wine Country. Smithsonian Magazine named Mill Valley one (No. 4) of the 20 best small towns--with a population under 25,000--in America. What sets Historical Mill Valley apart is not just the spectacular physical beauty of its setting, but equally its human environment-uniquely combining tranquility and liveliness, privacy and community involvement, urban sophistication and village charm. Starting in 1905 with The Dipsea Race, the first cross-country race in the country, Mill Valley has a rich cultural tradition with the Mountain Play in 1913, the Mill Valley Fall Arts Festival in 1957, the Marin Theatre Company, a professional regional theatre in 1966, the Mill Valley Film Festival in 1978 and the 142 Throckmorton Theatre since (website hidden)-opened in February 2012, after a lengthly absence, is the Sweetwater Music Hall located in the remodeled Masonic Hall, located two blocks from the Rental. Mill Valley is flanked by the picturesque City of Sausalito, 10 minutes south and the Town of Tiburon 10 minutes east with Angel Island State Park only a one mile ride (via Angel Island-Tiburon Ferry), all on San Francisco Bay. Although Mill Valley is close to San Francisco, it is adjacent to the Golden Gate National Recreation Area and only 10 minutes to the Muir Woods National Monument and Tennessee Valley Trail head, 20 minutes to Muir Beach, or Golden Gate Park in San Francisco, 30 minutes to Stinson Beach and less than an hour to Point Reyes National Seashore. Although one recommends longer stays, Mill Valley is 2-1/2 hours to Monterrey and Carmel and four hours to spectacular Lake Tahoe or Yosemite National Park; Yosemite Valley should be on your 'bucket list' and, especially during late spring, one of the most beautiful places in the world.